If it wasn’t already a heated rivalry, after Sunday, it became white hot. The Philadelphia Flyers and Pittsburgh Penguins are on a crash course for a first round matchup in the Stanley Cup Playoffs. Does April get any better than this? Well rest assured that it can, and will get better. Sitting currently, at the number 4 seed in the Eastern Conference of the NHL, are the Pittsburgh Penguins. As of today they hold a one point lead on the 5th seeded Philadelphia Flyers. The only question left to answer between these two teams, is who ends up 4th and who ends up with the 5th seed. So how did this heated rivalry, turn white hot? Sunday at the Console Energy Center, the Flyers and Penguins squared off, in what was the first of two meetings of the last week of the regular season. What was on the line? Home ice advantage. If the Penguins won, that would have put them five points ahead of the Flyers and all but assured them home ice advantage for the round 1 matchup. The Flyers had other plans, because if they won, it would put them back in the hunt for a 4th seed, and a shot at home ice advantage. Before we go any further, let’s examine what home ice advantage really would mean for both of these teams. The Flyers, who are 21-12-6 at home, have a far better record on the road (25-12-3). 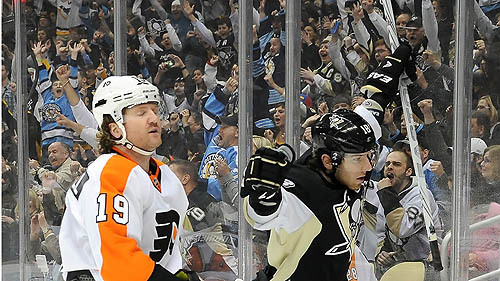 The Pens, on the other hand 27-10-2 at home, and 21-15-4 away from the Console Energy Center. So do the numbers add up? Some would suggest the Flyers sit in 5th and remain, as they play better away from the Wells Fargo Arena, whereas purist would have you believe that home ice advantage is huge come playoff time. Another factor, come playoff time, is that the Flyers are 5-0 in the Console Energy Center. So one might wonder if there is any truth to the term home ice advantage, when it comes to this series. At 1:14 of the first period, Steve Sullivan scored on backup goalie Sergei Bobrovsky. A sign that the Penguins came to play, and that sign was confirmed three and a half minutes later when James Neal snuck in a wrister making it 2-0 within 4 minutes of the puck drop. Was this going to be a blowout? Flyers coach Peter Laviolette brought out his secret weapon, the one timeout per game he has. During that timeout Laviolette was very animated, Claude Giroux recounts. The third period started off tight checking, until Pittsburghs Chris Kunitz was called for an interference penalty, putting the Flyers fifth ranked power play on the ice. The Flyers fifth ranked power play seemed sluggish for the first half of the period. Then finally set up in the Pittsburgh zone, Claude Giroux took the puck off of the half boards, fired a cross ice pass to Jakub Voracek, who deftly sent a one time pass to Wayne Simmonds, who was parked to the right of Marc-Andre Fleury. Simmonds quickly redirected the puck into the back of the net making the score 3-2, and from there on it was all Flyers. Jakub Voracek, Marc Andre Bourdon scored the next two goals making the score 5-2. Steve Sullivan scored at the 15:18 mark, bringing the Pens back to 5-3, but Jakub Voracek scored his second on an empty netter making the score 6-3. That is when all hell broke loose. After the puck drop, Danny Briere had the puck on his stick skating it out of his own defensive zone when Joe Vitale crushed Briere with a clean hit, and what ensued could only be described as pandomonium. Every player on the ice then found a partner and began to fight, but it didnt end there. Peter Laviolette, very upset with Dan Bylsma for putting out his fourth line, stood on top of the dashers across the benches, and screamed at Assistan Coach Tony Granato, as Flyers assistan Craig Berube played peacemaker, holding Laviolette back. After order was restored, and Laviolette, Simmonds, Rinaldo, Granato, and Asham were escorted off the ice. Giving the Penguins a power play, where Chris Kunitz quickly scored with only 33 second remaining in the game making the score 6-4, which was the final. This all sets up to make the last week of the season worth watching, as the final game between the Flyers and Pens will be played on Saturday, and could mean all the difference between 4th and 5th seed. Who will answer the bell come Saturday? Will there be carry over? These are all questions that will get answered. Until then, was a message sent? I say yes, the message was sent by each club, and that message is: We are ready! Let’s see how this plays out, because this very well could be the best first round matchup in the Stanley Cup playoffs, in years. Just another day in the state of Pennsylvania!